It doesn’t need express written consent to use the technology for “essential” alerts, the HIE’s CEO explains, and the result is better care. 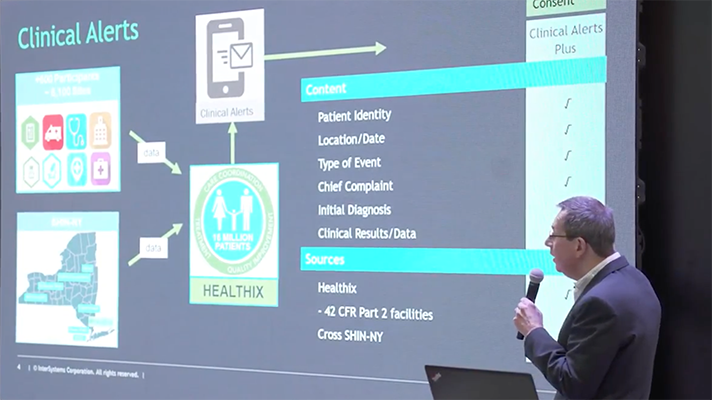 New York’s Healthix, the nation’s largest public health information exchange, has launched an Essential Clinical Alerts program that enables providers and care managers to be alerted in real time about a patient’s journey across the care continuum — whether it be a visit to the emergency department or an admission/discharge from a hospital within its network. The alerts, which do not require written patient consent, enable providers involved in the patient’s care to intervene and follow-up with their patients, with the aim of ensuring effective and cost-efficient care management. The subscription list only includes patients who have consented to receive treatment or care management services from the subscriber – as evidenced by the fact that the provider or plan has previously sent the patient’s identity to Healthix in an ADT message or enrollment roster, explained Tom Check, CEO of Healthix. “Although Healthix does not require the patient to sign a separate written consent for the provider or plan to receive full clinical data from Healthix, Healthix does require that the patient has entered into a relationship with the provider or plan for treatment or care management,” Check said. “There are a number of goals for this process – to provide information to the facility where an emergency department visit occurs, to prevent an unnecessary inpatient admission, to call the patient and/or schedule an office visit, and to follow up on the episode to make sure the patient receives appropriate care to prevent an exacerbation of the patient’s condition,” Check explained. Providers working with the Essential Clinical Alerts program have said based on their experiences with the program they see improved care by ensuring appropriate care and as a result improved patient outcomes, Check said. During the past year, Healthix has generated more than 7.3 million alerts for more than 180 organizations and 16 million-plus patients in its system.